Now is it panic time? After a two-game losing streak, Ohio State head coach Thad Matta talked logic and pointed out it’s only mid-January. But following a third consecutive loss on Thursday – 63-53 at Minnesota – the Buckeyes could soon be sounding the alarm. For the third time in as many games, sloppy play plagued Ohio State. The turnovers were down from the 21 and 17 in losses last week, but the Buckeyes’ 13 miscues seemed to occur at critical junctures. And after surrendering 84 points to Iowa, Ohio State allowed the Gophers to shoot better than 50 percent from the field. LaQuinton Ross provided a bulk of Ohio State’s offense, scoring 22 points on 8-of-17 shooting. He's scored 44 points and connected on nearly 50 percent of his field goal attempts in the past two games. The inability to find a second reliable scorer has proven to be one of the Buckeyes’ Achilles heels. Sam Thompson’s 12 points were second most with no other player scoring more than eight. The starting five, aside from Ross, scored 19 points. Attacking zone defenses doesn't appear to be in the cards. As a team, Ohio State was 11 of 18 from the free throw line. Aaron Craft committed five turnovers, pushing his three-game total to 15. Minnesota used its size advantage to scorch Ohio State down low. Newly-minted captain Elliot Eliason finished with 12 points and 13 rebounds. The Gophers outrebounded the Buckeyes 39-24 and scored 38 points in the paint. Ohio State attempted to do the reverse of Sunday's loss to Iowa and make a late second-half comeback, which has turned into the Buckeyes' calling card. Trailing by seven with 9:27 left, they trimmed the Gophers' lead to three. But Minnesota used a 13-2 run in the final minutes to put the game out of reach. Two-game losing streaks under Matta are rare for Ohio State. Three-game skids are even more infrequent, the equivalent of spotting an ivory-billed woodpecker. The last time OSU lost three-in-a-row was February 2009. Emotions were high throughout the night as both Ohio State and Minnesota entered 2-2 in the Big Ten and in need of a crucial conference win. After a double-foul involving Ross and Minnesota’s Oto Osenieks with 13:41 left in the game, Richard Pitino erupted, throwing his jacket and berating officials. He was frustrated due to several close calls with Osenieks’ foul being the final straw. Pitino was assessed a technical foul, which caused Minnesota fans to throw drink cups on the court. In the end, Pitino got his first signature win as the Gophers' head coach, much the same as Iowa's Fran McCaffery did Sunday in Value City Arena. 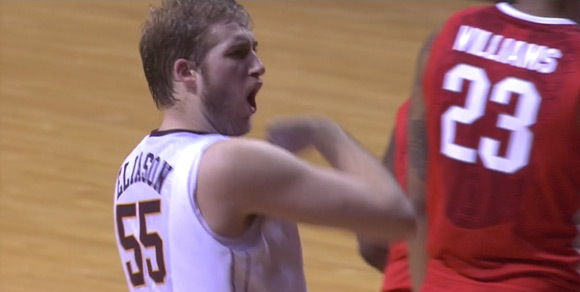 Minnesota ended a six-game losing streak to the Buckeyes. The Gophers turned the ball over 10 times in the first half, including nine times in the first 10 minutes. But Ohio State’s offensive woes didn’t allow it to build a lead. The Buckeyes were only 3 of 14 shooting midway through the half and went five minutes without a field goal. They finished the first 20 minutes with a 38-percent shooting percentage. Their biggest first-half advantage was only three. Minnesota actually led by six late in the half.